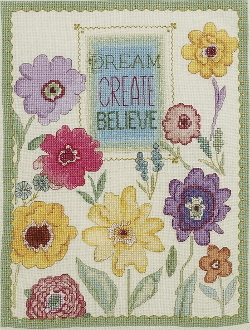 A beautiful modern floral design with "Dream Create Believe". Kit contains: 28 count Ivory Evenweave 100% Cotton fabric, DMC cotton embroidery floss, floss separators, needle, instructions and chart. Design size: 10"w x 13"h (25.4 cm x 33.02 cm).